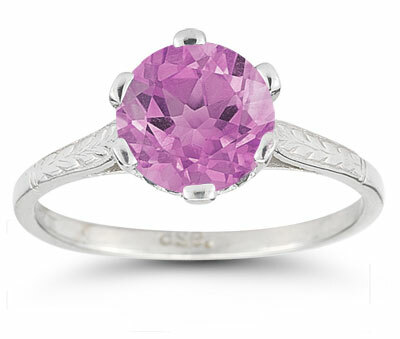 Vintage style is given a sweet update with a blossoming pink topaz gemstone. This Apples of Gold ring makes jewelry history with the classic vintage appeal of engraved leaves on the silver band. The mounting makes its own appeal with the gorgeous cutout of a heart shape set between prongs. Rounding up the fashion-forward side of the ring is the gleaming pink topaz gemstone, which is round cut for excellent shine. This rosy-colored stone ensures this piece is anything but ordinary. We guarantee our Sterling Silver Vintage Floral Pink Topaz Ring to be high quality, authentic jewelry, as described above.